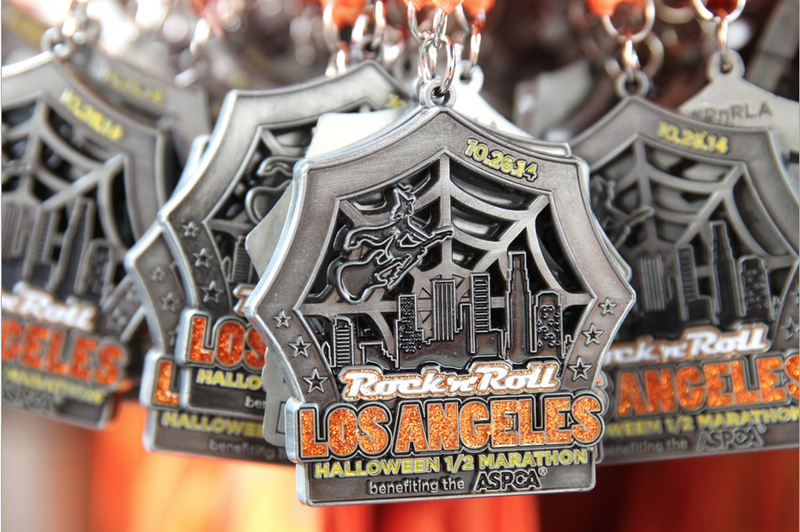 This year marked the 5th running of the LA Rock ‘n’ Roll Half Marathon as thousands of costume-clad Angelenos lined the streets near the Staples Center for a pre-Halloween romp through the city streets. 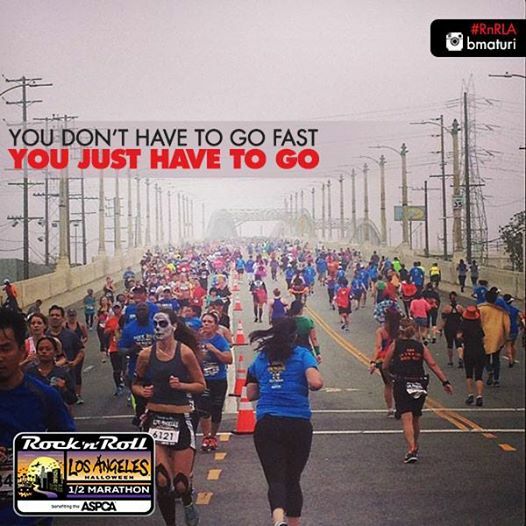 As part of the Rock ‘n’ Roll series, registration costs for the LA Rock ‘n’ Roll Half tend to be on the higher side, but there are plenty of ways around paying out through the nose. Of course, first of all you can always pay as early as possible before rates go up. In addition, you could choose one of the group deals that Rock ‘n’ Roll offers, either the season pass or the 3-pack of races for $199 (the route I went this year). In addition, Rock ‘n’ Roll likes to give discounts through social media (check your FB page) and they typically run a $13 off special for all of their races on the 13th of each month. The expo for the race was held at the LA Convention Center in downtown Los Angeles. Convention Center parking was $10 and there are also plenty of nearby lots for you to choose from. I decided to stretch my legs a bit and parked a few blocks away, saving myself the parking cost and instead fed a meter for far less. 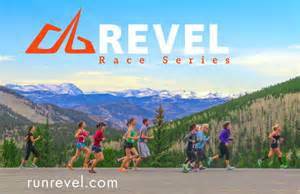 The expo itself is a decent size, with plenty of vendors on hand for you to check out the latest racing gear, sample some of the running grub available or sign up for upcoming races. And once again, the main sponsor for this year’s race was the ASPCA, so their paw prints were all over the expo as racers stepped up to show their support for our four-legged friends. NOTE: Runners had to pick up their own bibs; no exceptions. Vote for your favorite bling! Racers didn’t get to vote on the tech shirt, which is a shame because this year’s edition felt like a step backward from last year’s cool design. The 2014 shirt is white in color (sorry, I’m just not a fan of white shirts… I feel it’s lazy) and featured a gray muted mash-up design of musical notes, speakers, palm trees and a witch (remember, it’s Halloween) overlaid by an orange-colored outline of the letters “LA.” In my opinion, not one of their better shirts (give the racers a say next year, perhaps). Racers were also given a black drawstring backpack, which doubled as a gear check bag. Since the race begins near the Staples Center, parking is not much of an issue (as long as you avoid the street closures) and racers can park at the convention center or one of the nearby lots. But be prepared to spend anywhere from $10-$20. I chose to take the Metrorail downtown, parking at the Universal City lot and grabbing the Red Line train to 7th Street (about 1/3 mile from the start area). Round trip only cost $3.50 ($1.75 each way, plus $1 if you need a TAP card) or you can purchase a day pass for $7. The trip for me only took about 30 minutes on the train, about the same as driving downtown and finding parking, plus it’s pretty stress-free. The course was the same as last year, featuring a modified “Out & Back” route. 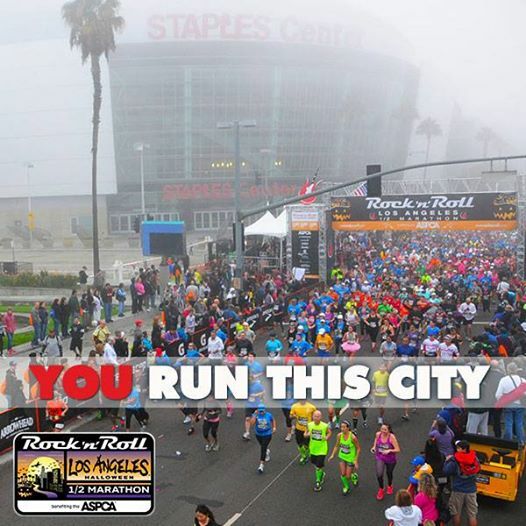 Starting at the Staples Center you head south on city streets, looping around the LA Coliseum and making your way back past the Staples Center around mile 6. After that, you head north through the 2nd Street tunnel, along Figueroa and Flower before a back & forth across the popular 6th Street bridge and then back toward downtown and the finish. The course itself is mostly flat with the only true incline being on the 6th St. bridge (and you do get to run back down it). I once again had an issue with the length of the course, as it seemed to be longer than 13.1 miles (my GPS came in at almost 13.4). Be sure to cut corners as tight as etiquette allows and don’t weave too much, if you want to make sure you don’t add too much length. NOTE: Be aware that your GPS will almost certainly lose its connection during your two trips through the 2nd St. tunnel. Fortunately, my Garmin recalculated shortly after emerging both times. I run; you run; he she it runs. LA Rock ‘n’ Roll typically has decent course services at their races. Plenty of porta-potties were on hand at the start line and there were adequate water/energy drink stops (Gatorade Endurance was the drink of choice for 2014) manned by energetic volunteers. Gu gels were given out around mile 9 on the course. I also saw plenty of medical tents along with support personnel cruising the course on bicycles. I did have an issue with one of the services, as I signed up for runner tracking (along with a friend or two) and no one received any text updates. Not sure if there was a ghost in the machine (remember, it’s Halloween) system wide or just a glitch with mine. Rock ‘n’ Roll races also tend to have good finish line/post race activities. After receiving my finisher’s medal from a volunteer I made my way along the chute and received a decent array of snacks, including: water, chocolate milk, gatorade, tiny bags of snack mix and bananas. Once again, no bags on hand to carry our post-race bounty, but maybe they’ll get it right next year. The post party was located near the exterior of the Nokia Theater and featured a stage with music and a Michelob Ultra beer tent (each 21+ racer got a ticket for a free post-race brew along with their bib). There were also a few other vendors around giving out some swag as well as Rock ‘n’ Roll tent where runners could grab some last minute race merchandise. This was my second time running the LA Rock ‘n’ Roll Half Marathon and it felt very similar (not in a bad way) to last year’s race. I enjoy the runners in costumes as well as the downtown course. And while there is room for improvement… better job on the shirts next year please, it’s a fun local race, well-organized and one that I plan to continue on an annual basis. 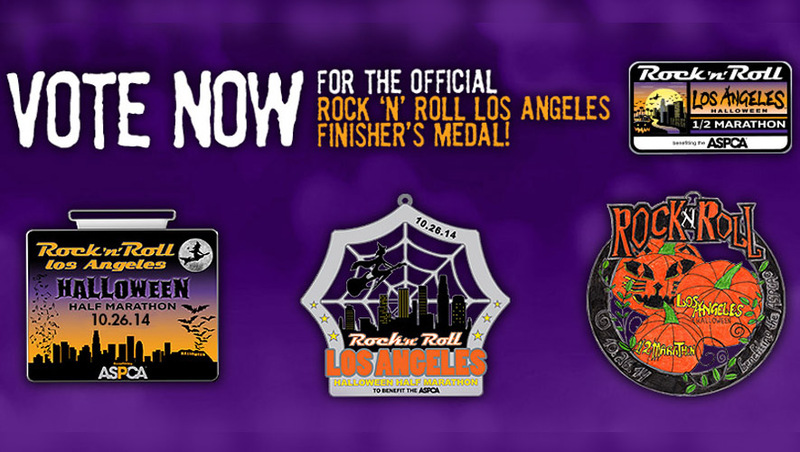 Posted on October 28, 2014, in General, Race Review and tagged LA Rock 'n' Roll Half Marathon. Bookmark the permalink. 4 Comments. I love the RnR LA course. Landmarks, visual appeal, variety (as in, no long stretches of blah . . . I’m looking at YOU, Surf City). And while I do like the white tech shirt (I know we disagree on this), I am on board with you on the fact that the overall design this year pretty much sucked. C’mon, man you’ve got the Halloween theme to work with. A giant stencil of LA in front of a vague gray design? If it’s my choice, why not a green tech shirt with a large and detailed version of the “witch flying a guitar” image? That’s just off the top of my head. It was an enjoyable course, very nice to run through downtown LA. And I definitely think if they’re going to do the “halloween” theme with the medals, than commit to it with the shirt too (like they did last year). And I think any of the Halloween colors black, orange, green, purple or even yellow or red (blood you know) would work fine. True… white shirts do seem to be stain magnets. And I just find white shirts to be “too easy.” Show some imagination with your canvas and add some color.